I have had a long-term, love-ignore relationship with Node.js. I have taken Node classes, read Node books, and tinkered with Node programming both on Windows and Linux machines. Sometimes I have loved working with Node.js. Other times, I have ignored it for months at a stretch while I rush around trying out other choices and development distractions: Clojure, Erlang, Grails, Hadoop, and Ember.js, for example — the list goes on and on. Node.js in Practice is aimed at intermediate Node.js programmers and even advanced Node.js programmers. There is some awareness that beginners also may be reading this book. So the authors start by explaining Node from the standpoint of “what it is, how it works, and why it’s something you can’t live without.” Then they quickly recommend that Node newcomers should stop for now and read another good, but more basic, how-to book first: Node.js in Action. In Node.js in Practice, the learning curve can start getting steep fairly quickly, especially for those of us who have worked somewhat superficially with Node in web projects that also involve other software (such as the MEAN stack: MongoDB, Express and AngularJS, plus Node). Fortunately, the authors, Alex Young and Marc Harter, take a very focused, three-part approach that keeps Node.js centered in the spotlight and promotes deeper understanding. The book offers “115 techniques…each module covering a specific Node.js topic or task, and each divided into practical Problem/Solution/Discussion sections.” I really like this approach, and the illustrated discussions that accompany each short code example are especially helpful. For me, it has been a pleasure to upgrade to the latest version of Node.js and reconnect with it using this new book. Despite my previous experience with Node.js, I see a lot to learn! 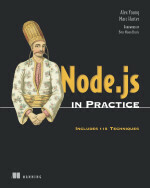 My thanks to Manning for providing a review copy of Node.js in Practice. After a quick first glance, you might look right past this book. You might assume its title, “The Modern Web,” simply introduces some kind of heavily footnoted, academic study of the Internet. Not so, Web breath. In this case, it’s the subtitle that should grab your attention. Gasston’s well-written book zeroes in on the three “web technologies that can be used anywhere, from open websites to device-specific web apps.” And on all sorts of devices, ranging from tiny phones to tablet computers to wall-covering HDTVs. There also are two appendices: Browser Support as of March 2013 and Further Reading. Peter Gasston has been a web developer for more than 12 years, and his previous book is The Book of CSS3. Many Ruby developers love Rails for its power and capabilities as a model-view-controller (MVC) framework. But some of them don’t like Rails’ size, complexity, and learning curve. Jump Start Sinatra is a well-written, appropriately illustrated guide to getting started with this popular free software. Ruby newcomers may wish for a few more how-to steps or code examples. But the counter argument is, if you’re brand-new to Ruby, save Sinatra for later; focus on getting learning Ruby first. Some of those “big production sites,” according to Wikipedia, include such notables as Apple, LinkedIn, the BBC, the British government, Heroku, and GitHub. The overused term “killer app” tends to kill my curiosity about books with “killer” in the title. The focus, in UX design, is on “understanding the behavior of the eventual users of a product, service, or system. It then seeks to explore the optimal interaction of these elements, in order to design experiences that are memorable, enjoyable, and a little bit ‘wow’,” the author says. And, you likely will spend time talking with other members of your UX design team, plus potential users of your product, service, or system. Some of the chapters also deal with prototyping, testing, re-testing and tweaking, and how to modify a design based on what you learn after a product, service, or system has been launched. A key strength of Killer UX Design is how it illustrates and explains the real-life — and seldom simple — processes and steps necessary to design an app that is both useful and easy to use. Increasingly, the world of Web development is taking on a “mobile first” attitude. And for good reason. Sales of desktop and laptop computers are shrinking, while sales of mobile devices seem to be swelling into a flood.